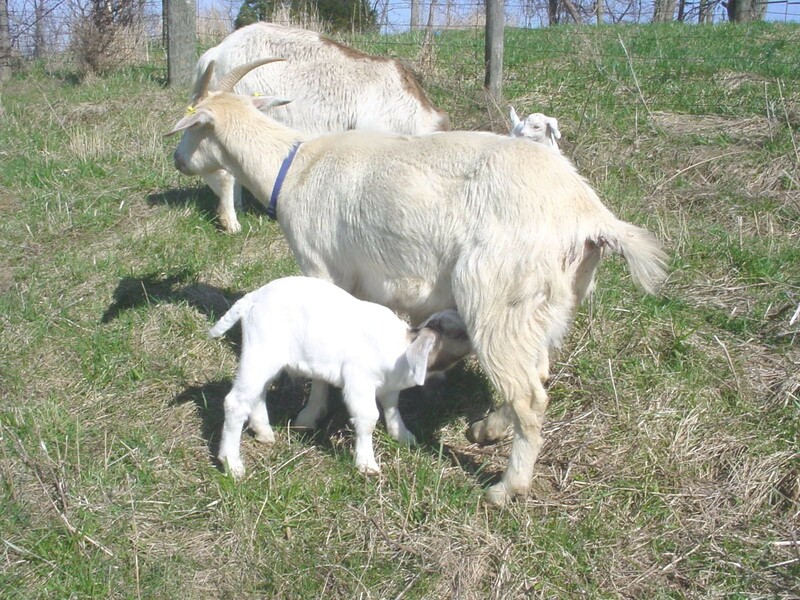 Caring for baby goats and their mothers is enlightening. We give kids access to hay, starting when they can only nurse, because the microbes stimulate development of the rudimentary stomach which will digest their vegetation diet. Even at a day old, they mouth the dry stems curiously, as if wondering how that could possibly be food. Jessica Snyder-Sachs’ Good Germs, Bad Germs is a fascinating account of the enormous (mostly benign) role microbes play in our lives. Recent studies take it further: from benign to actually therapeutic. Other studies note the increase in food allergies and immune sensitivities in our population, and speculate that early-childhood exposure to diverse microbes is needed for the immune system to develop correctly, and not wind up triggering reactions to otherwise benign substances. I do notice that during the Summers when I have all the fresh* goats’ milk I can drink, molds and pollen bother me a lot less. Getting back to my young guest, her observation about the mare’s udder started a train of thought that is only now being debated in scientific literature. If the placement of udders in grazing mammals were not an adaptive arrangement (i.e. one that promotes survival of the species), surely they would all be extinct, or a different structure would have evolved, to “protect” the young from all those scary microbes. In fact, as seems clear from reading Good Germs, Bad Germs, the kid (lamb, foal, calf etc), which is born with a sterile gut, must acquire from somewhere the microbes to digest even its dam’s milk, as well as plant material. Thoroughbred foals from high-value brood mares are notoriously prone to life-threatening digestive upsets (“scour,” meaning exactly what the name implies), and I’ve wondered whether the problem is a too-clean brood barn – or mare. Nobody on hand in a wild herd to disinfect the mares’ teats before putting the foal to nurse! I say all that to say this: our answer to food-borne disease has been to basically train a flame-thrower against all germs. Now we have lactose intolerance and an epidemic host of other immune complications. The whole model needs re-thinking. And I’m going to keep drinking fresh* milk. *I refuse to call it “raw,” which implies it needs to be cooked. The Basil I sell is not “raw.” An uncooked potato is “raw.” Leafy just-picked basil is “fresh” – ready to eat. (If you heat it to 140°, it won’t taste nearly as good ;-) So is milk. “But they’ll say milk in the grocery stores is fresh.” No it’s not. If the milk I drink is “raw,” meaning “needing to be cooked in order to be consumed,” then commercial dairy milk is cooked. “Pasteurized” is not a technical term, just a historical reference.